The “Tax Cuts and Jobs Act” (TCJA)—the massive federal tax cut passed in December 2017—has failed to produce the benefits touted by its promoters. And if history is any indicator, there is no reason to believe things will change in the future. The following debunks several often-touted claims made by TCJA backers. Based on estimates from the Institute on Taxation and Economic Policy (ITEP) for 2019, 73.0% of the total federal tax cut under the TCJA will go to the 20% of Americans with the highest incomes, and the top 1% will get 27.5% of the total cut. Meanwhile, middle-income Americans—defined here as the 20% of the population in the middle of the income distribution—will get just 8.0% of the tax cut. The average tax cut for Americans in the top 1% will be 69 times greater than the average middle-income tax cut. 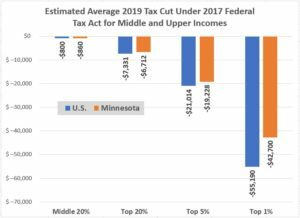 The distribution is nearly as lopsided in Minnesota, with the top 20% getting 68.4% of the tax cut and the top 1% getting 21.8%, while the middle 20% get just 9.0%. 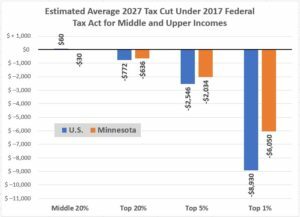 In Minnesota, the top 1% will get an average tax cut 50 times greater than that of middle-income taxpayers. Even if we examine TCJA tax cuts as a percent of income, upper-income households do far better than the middle-class, both nationally and in Minnesota. Proponents of the federal tax overhaul argue that there has been a substantial increase in wage growth since its passage last December. However, the aggregate data shows no such trend. 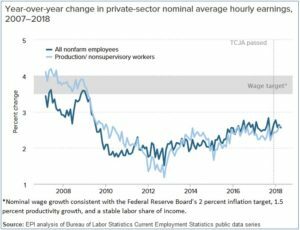 In a recent report, the Economic Policy Institute (EPI) observed no noticeable uptick in the year-over-year change in private-sector earnings since passage of the TCJA. Even if we make the highly unlikely assumption that all the pay hikes attributed to the TCJA were actually the result of the new law, the aggregate jump in earnings amounts to a tiny percentage of the massive corporate tax cuts doled out. At best, the new federal tax law is the epitome of trickle-down economics, with workers getting pennies for each dollar of federal business tax cuts. 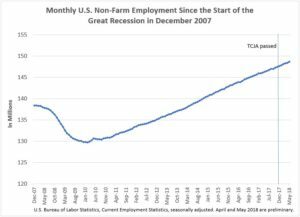 The average monthly rate of job growth in the United States since passage of the federal tax act has been 0.14%—the same as it has been for the previous seven years. In other words, the average rate of job growth pre- and post-TCJA are identical. Minnesota’s rate of job growth has also shown no improvement since passage of the TCJA, based on Bureau of Labor Statistic (BLS) data. There is no evidence that the TCJA has stimulated an increase in employment, either in Minnesota or nationally. 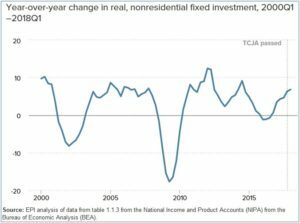 While it is true that nonresidential fixed investment has increased in the first quarter since passage of the TCJA, data compiled by EPI reveals that this is simply an extension of a trend that began 18 months prior to passage of the TCJA. The rate of business investment growth since passage of the TCJA is typical of rates observed throughout the 21st century, excluding recessions. More time is unlikely to improve the outcomes we see from the new federal tax law. The primary permanent feature of the TCJA is a large corporate tax cut. EPI analysis based on U.S. and international data shows that past corporate tax reductions have not translated into significant growth in wages or business investment. In addition, past corporate tax rate reductions are not correlated with meaningful increases in employment, based on North Star analysis of BLS data. The principal by-product of regressive tax cuts such as those in the TCJA is an increase in income inequality and reductions in funding for programs that benefit low-income people, made necessary through the massive loss of federal revenue and a ballooning federal deficit. The data thus far provides no evidence of an economic renaissance resulting from the new federal tax law—only a continuation of trends well underway before passage of the TCJA. And a sober analysis of past trickle-down tax cuts gives little reason to believe that conditions will improve markedly in the future. In fact, a soaring federal deficit, cuts in funding for federal programs, and increased income inequality is likely to make the TCJA a long-term negative for the U.S. economy. *Under the TCJA, income tax brackets will be adjusted annually for inflation based on the chained Consumer Price Index, which will cause bracket thresholds to increase at a slower rate. As a result, households will move into higher tax rate brackets at lower income levels, thereby causing income taxes to increase for many households. †A March 2018 North Star article contains additional information on the impact of the TCJA on Minnesotans by income group.